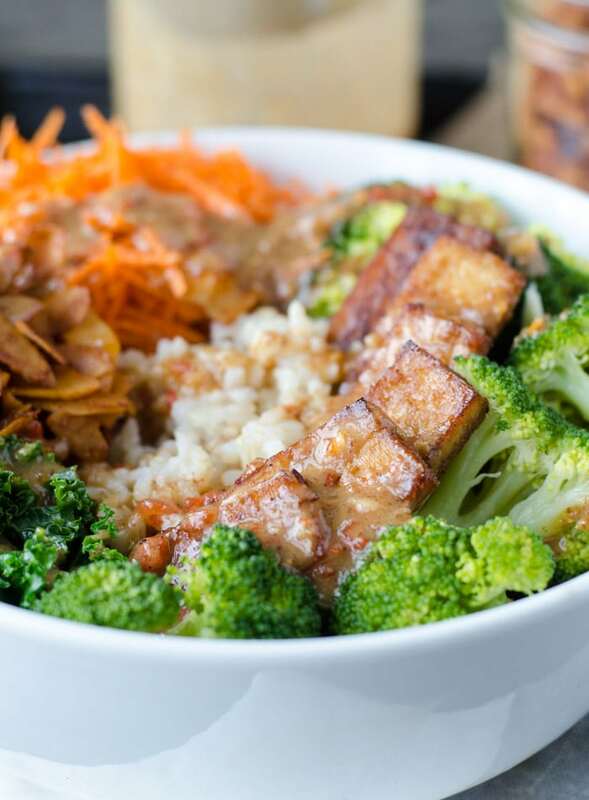 This Broccoli Brown Rice Bowl with Almond Satay Sauce is so satisfying and flavourful you’ll want to eat it day after day. Loaded with healthy ingredients like broccoli, kale, roasted red pepper and brown rice, not only is it delicious, it’s highly nutritious too. 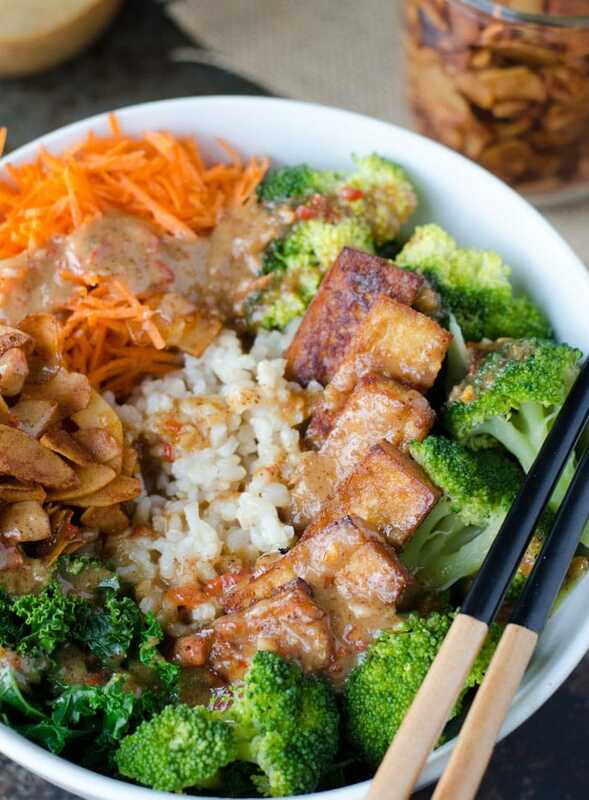 All that healthy goodness is topped off with crispy coconut bacon and perfectly sweet almond satay sauce that might just have you licking the bowl. I scoured the internet for an authentic satay sauce recipe and came across many different variations. 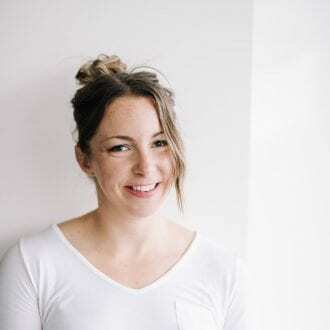 I found recipes made with a range of different ingredients from lime, to tamarind, to ginger, to coconut milk, to sweet chili sauce and red curry paste. I discovered there’s such a thing as sweet soy sauce, or kecap manis, that’s thicker and sweeter than traditional soy sauce and is often used in satay sauce recipes. And from what I can tell, authentic Thai satay sauce uses tamarind paste, brown sugar and peanuts, does not contain lime or ginger, and making it involve sautéing onions and garlic before simmering them with the rest of the ingredients. Thai folks correct me if I’m wrong. As much as I wanted to keep this satay sauce authentic, I also wanted to keep it as simple as possible, so I kind of cheated by using sweet chili sauce instead of sautéing onion and garlic. There are few moving pieces in this bowl so I wanted to keep the sauce really easy. It worked out great though and the end result is an flavourful, creamy and delicious almond satay sauce that is absolutely perfect for this bowl. I used almond butter instead of peanut butter or crushed roasted peanuts but you can use peanut butter if you prefer. Just make sure you use natural peanut butter with no added sugar or oils. You could also switch up the tofu, and try my Black Pepper Garlic Tofu, BBQ Tofu or Curried Tofu. If you’re in a pinch or you don’t feel like making coconut bacon (although I highly recommend that you do! ), you can go ahead and use coconut flakes or better yet, toasted coconut. If you have the time, you’ve gotta try making a batch of coconut bacon. It’s really easy to make and can be kept in the pantry for weeks and added to salads, bowls, sandwiches, tofu scrambles and even smoothie bowls. Most coconut bacon recipes call for liquid smoke but it can be hard to find and I can’t be bothered to buy it just for coconut bacon, so I make mine without it. I use tamari, maple syrup, apple cider vinegar and smoked paprika. The apple cider vinegar isn’t required but I like the tanginess it adds. I’ve made coconut bacon with just tamari and maple sryup and it still tastes great though. The most important thing with coconut bacon is to make sure it cooks evenly and doesn’t burn. To do this, you’ll have to keep a close eye on it while it’s baking. 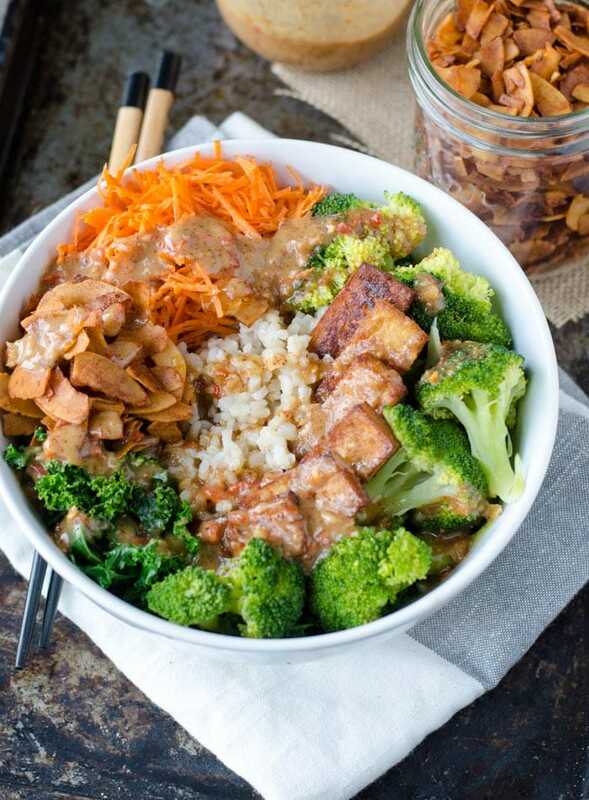 Alright, so we talked about the almond satay sauce and coconut bacon…what else is in this bowl? 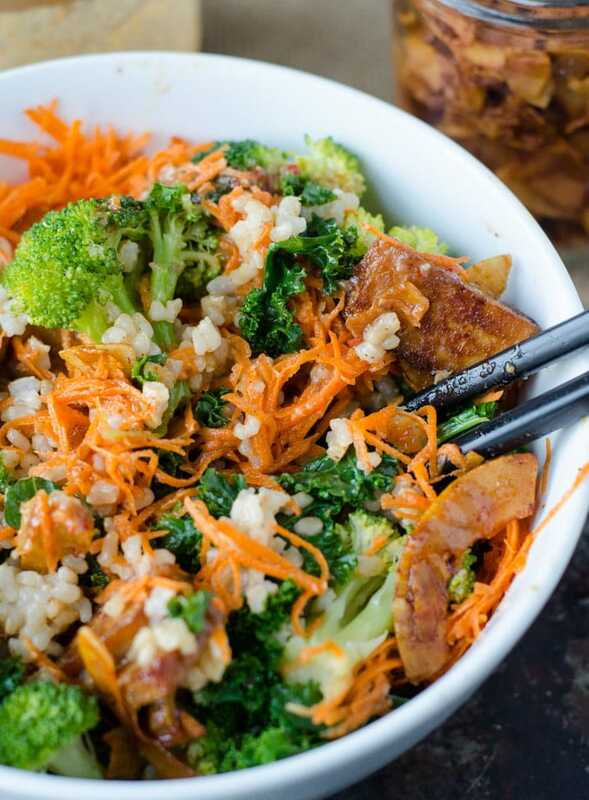 I added brown rice, kale, steamed broccoli and grated carrot and it all comes together beautifully with the creamy almond satay sauce and sweet and salty, crunchy coconut bacon. So many flavours, so many textures, so much goodness! Prefer a visual of this recipe? Follow along as I make these in the video below. 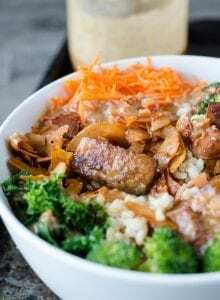 There are few steps involved in these broccoli brown rice bowls but the result is well worth the effort. 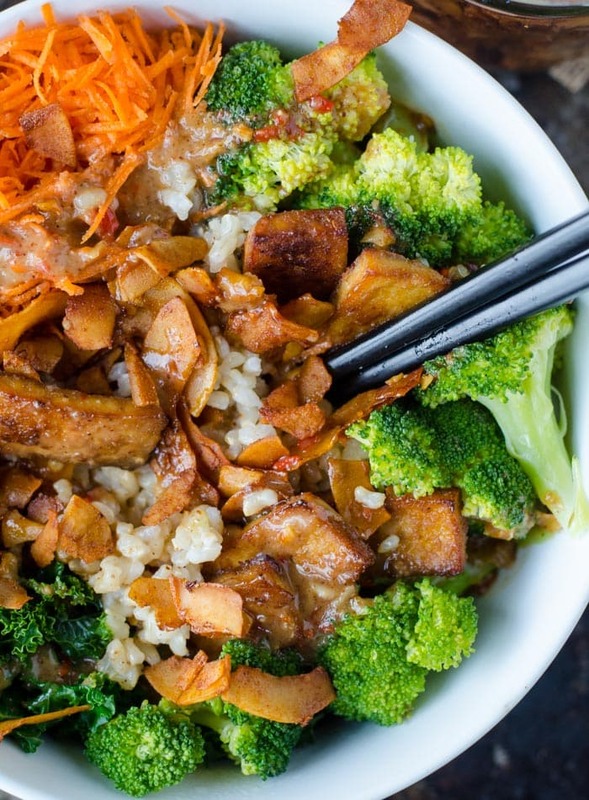 The sweet and tangy almond satay sauce with the salty, crunchy coconut bacon, chewy brown rice and fresh veggies is a match made in heaven. 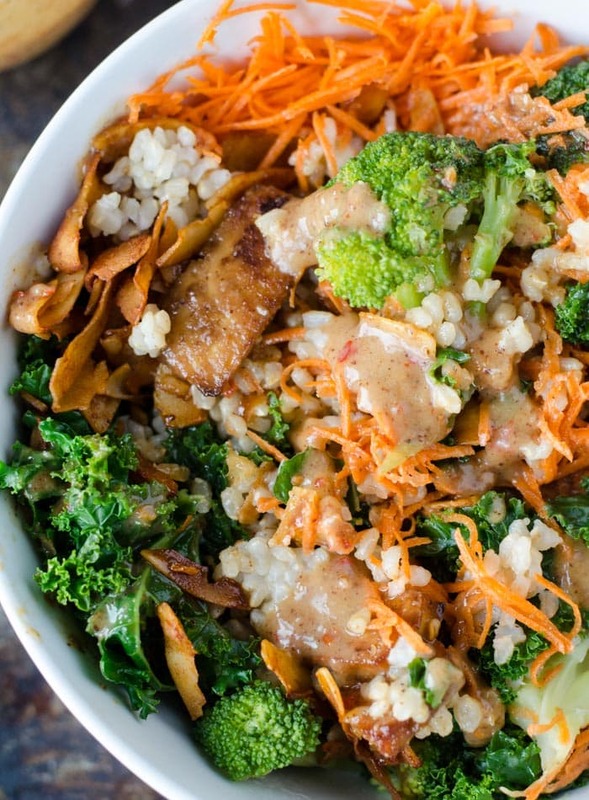 You’ll love this vegan and gluten-free, flavourful, healthy and nourishing bowl. Slice a block of tofu into slabs and add to a bowl with the rest of the ingredients. Let it sit while you make the coconut bacon. Once the coconut bacon is done, increase the oven temperature to 400 degrees. Lay the tofu slabs out on a parchment paper or silicone mat-lined baking sheet. Bake for 20 minutes, then remove and flip each piece. Place back in the oven for 10-20 minute until brown and crispy. Add all of the ingredients to a bowl and mix well. Optional: let marinate for 5-10 minutes. Spread the coconut on a silicone mat or parchment paper-lined baking sheet. Make sure it’s spread evenly and overlapping as little as possible. Bake for 5 minutes then remove from the oven and give it a quick stir, again making sure it’s evenly spread around. Place back in the oven for 2 minutes, then give it another quick stir. Continue, checking every 2 minutes until it’s golden brown and ever so slightly starting to darken around the edges. Be careful as it can burn quickly. Once it’s done, let cool completely before storing in an air-tight container. Store any extras in the fridge for up to 3 days. Start with a base of lightly steamed kale. Add the brown rice, broccoli, tofu and carrot. Top with desired amount of almond sauce and coconut bacon and dig in. The sauce recipe makes enough for 3-4 bowls. Adjust amounts of rice, broccoli, kale and carrot for how every many servings you’re making. Makes 2 cups of coconut bacon. Store extra in an airtight container and add to sandwiches, soups, salads, bowls, oatmeal, smoothie bowls or just for snacking. Makes enough tofu for 3-5 bowls. This looks absolutely amazing!! I am always looking for new recipes my hubby will enjoy that have tofu!! I’m not a big meat eater and this looks delicious! Very detailed recipe. Gonna try it! That coconut bacon is the best idea I’ve ever heard. Yum! I love everything about this dish. Omg then pics look so mouthwatering. I always try new recipes. Definitely trying this one. Special credit to your pictures. Wow. That looks delicious and I would never have thought of Coconut Bacon. I am pinning to save for later. That sauce sounds amazing! I’d be putting it on everything and anything! What a fun recipe! 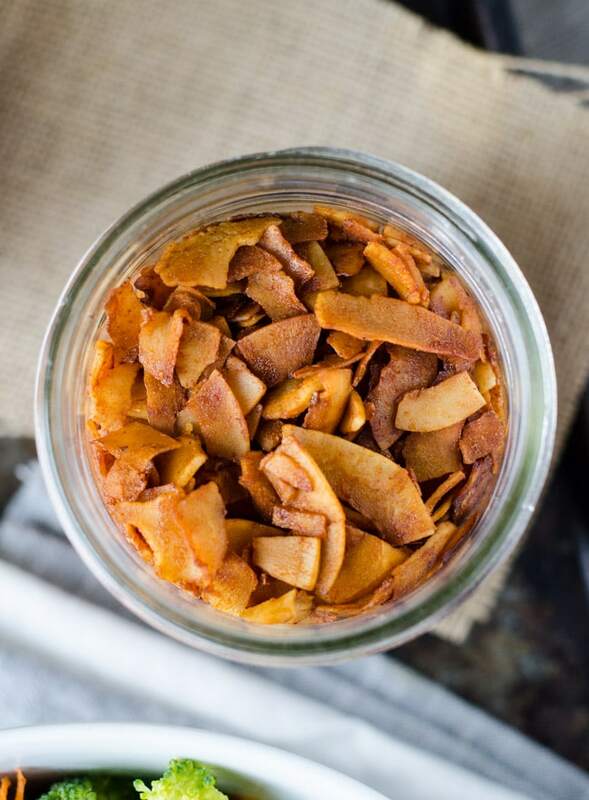 I’ve always wanted to try making coconut bacon – now I must! And thanks for the info on how to do it without liquid smoke! Yes, try it! So easy and so good on everything. This looks delicious! I’ve only made coconut bacon once because I typically just buy it to have on hand since it’s usually a last minute addition. I’ll have to give it a try again. It’s so easy, totally worth making your own! This is one of my favorite lunches. But not surprisingly, I’ve never topped it with coconut bacon! How fun and flavorful is that? 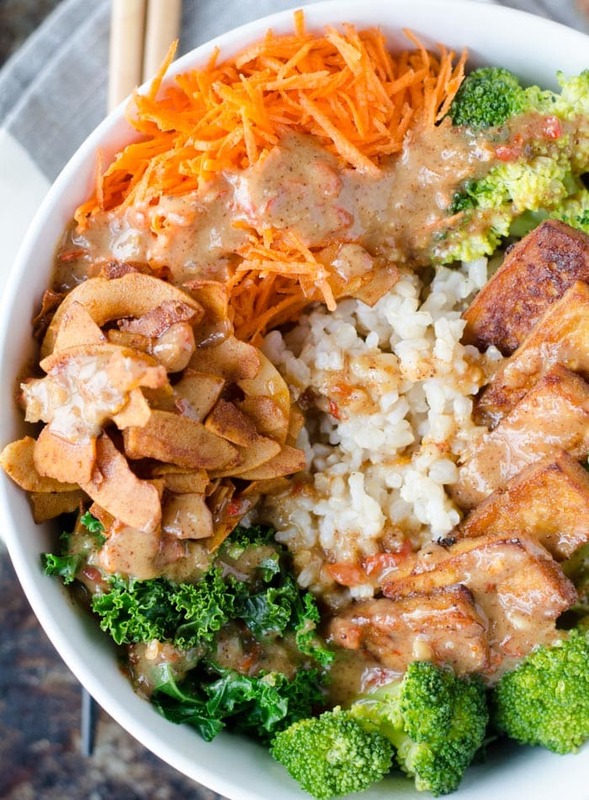 So much yumminess in one bowl! I could definitely see eating this a few times a week! just so you know – I am drooling at those pictures and I am very hungry! I wish technology would make it easier to look at pictures and feel the taste. this looks amazing! Wow, this looks amazing. I just love how there are so many great ways to cook brocolli. This looks delicious and doable! I love everything in this bowl! But that sauce!! It sounds so good! Love easy to make bowls like this one for dinner! looks so delicious and right up my alley. Definitely saving and hoping to make soon! Such a yummy recipe! I’ve been trying to break out of my usual stir-fry and curry rotation, and this was a great new type of flavor that I hadn’t had in a while. Preparing it was a bit involved, so it’s probably not something I’ll make regularly, but that sauce is definitely going on my list of go-to stir-fry and bowl sauces. The coconut bacon is also delicious! It’s kind of shocking how much of a bacon-y flavor it has! Can’t wait to eat the leftovers for lunch! I hear ya, it is a little involved but if you prep everything ahead of time it’s really quick! The sauce is so good, isn’t it?! And the coconut bacon, YUM!! Glad you enjoyed! Hi, thanks for the recipe for the coconut bacon, but I think it must be missing something (or maybe I am?). I don’t see the amount of bacon mentioned in the recipe nor anything in the method that concerns the bacon at all- all that is mentioned is baking the coconut. Thanks for clarifying! You’ll see in the very step of the instructions – top with sauce and coconut bacon and dig in! 🙂 You can use as much as you want..I usually add a couple tablespoons per bowl.